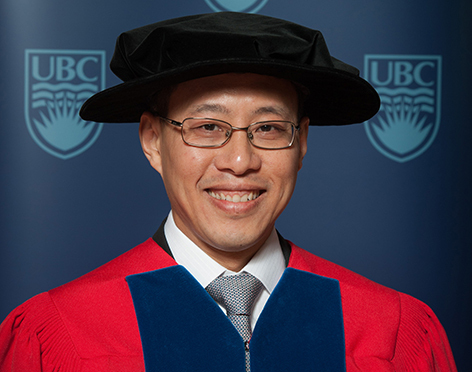 MADAM CHANCELLOR, UBC alumnus Raymond Lee exemplifies many of the qualities that we as an academic institution value and celebrate: a strong record of academic achievement, career success, and a commitment to public service. After graduating with honours from the UBC Faculty of Applied Science in 1993, he founded the Lee & Man Paper Manufacturing Company, which has grown to become one of the top global producers. With a clear commitment to social responsibility, the company is one of the most environmentally friendly paper manufacturers in the world. Its production processes utilize over six million tons of recycled material annually, while consuming the least amount of water and energy among its peers. At just 43 years of age, Mr. Lee has been appointed to the boards of several community organizations and government committees. By way of example, he is currently a member of the National Committee of the Chinese People’s Political Consultative Conference, one of the top governing bodies of the Chinese government. He also serves on the executive committee of Hong Kong’s Green Council, a non-profit body that promotes environmental protection in business practises. He has exercised considerable philanthropy among some 40 health care, education and social service organizations in Hong Kong and elsewhere in the People’s Republic of China. He has also supported his university, with a generous gift to help establish a new alumni centre to serve as a hub of connectivity between and among UBC students and alumni. Not surprisingly, Mr. Lee has received countless awards for his business success and community service, including the 2002 Young Industrialist of Hong Kong Award, the 2008 Ernst & Young Entrepreneur of the Year Award for China, and as an Honorary Citizen of several Chinese cities. Madam Chancellor, in recognition of his achievements and commitment to public service, I ask you to confer the degree Doctor of Laws, honoris causa, upon RAYMOND LEE MAN CHUN.